We made it to 20! Last month my husband and I celebrated our 20th wedding anniversary. It was an exciting milestone to celebrate in our relationship. I wanted to make this anniversary extra special by giving him a couple of meaningful gifts. But what?! I thought about it for awhile….. this is what I ended up giving him. I went to a local pottery painting place and painted him this little keepsake box. Perfect for all those loose coins, receipts and trinkets around the house! You can't quite see from this picture but it says "Happy 20th Anniversary with Love" all around it and the inside is personalized with our names and the date. 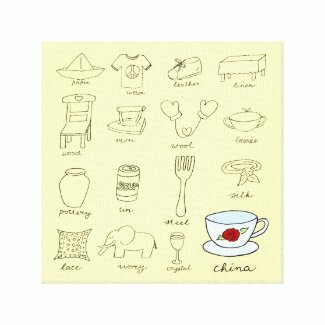 I also decided that I liked the idea of the traditional wedding anniversary gifts but knew he wouldn’t care for a set of china which is the traditional gift for the 20th wedding anniversary. 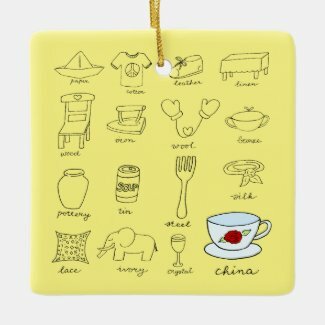 I decided on a modern take on the traditional wedding gifts by illustrating each of the gifts in simple line drawing doodles with hand lettering that described each gift. I kept all of the illustrations plain except for the 20th anniversary gift of china which I colored. I created this design on a bright yellow pillow that looks perfect with the colors of our modern bedding. He loved it! 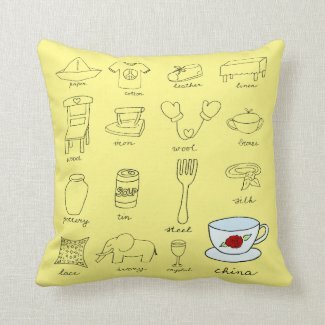 This pillow is a comfy and practical yet fun keepsake to remember our 20th anniversary. 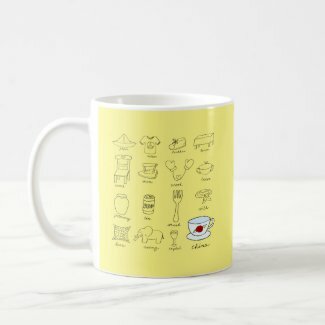 Since our anniversary, I was inspired to create more gifts with these illustrations as I discovered there are not that many cute gifts available to celebrate a 20th anniversary (most are for the 25th anniversary but don’t you agree that 20 years is a special milestone too?!). 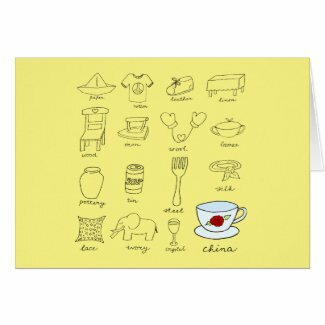 So I want to share this collection of gifts with my design. The message on these lover's mugs with heart handles can be customized and you can even personalize with the couple's names! If you are looking for a home decor gift, this clock will be a great conversation piece in your living room or kitchen! 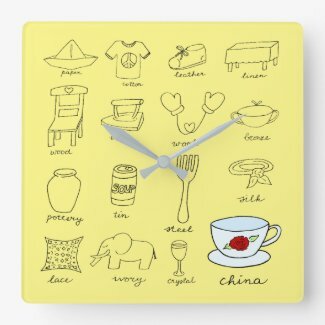 You can easily customize the yellow background color of the clock to match it to your home decor. Each morning your loved one drinks coffee out of this awesome mug will be a great one! The back of this ornament can be personalized with the couple's names as well as a special greeting, or if you'd like, the anniversary date. For the wife who loves watches (can you ever have too many watches? ), she will think of you every time she checks the time! The stylish black band will match almost all of her clothing. To wrap your gift with as much care as you exercised while choosing the gift, here are a greeting card and gift bag with the design, both with customizable messages. I hope that you will like some of these gifts if you are shopping for a meaningful gift for your spouse or a special couple celebrating their 20th anniversary. Because I love to hear your stories.... How long have you been married? Please share your story about celebrating a special anniversary in the comments below. Thank you for supporting my art! Aw, thank you so much! It was fun working on the illustration! Buying Perfume can be a very hard decision, especially when you buying that perfume for your friend or lover. Different people will have different choice of perfume.